Towns must first build their network. 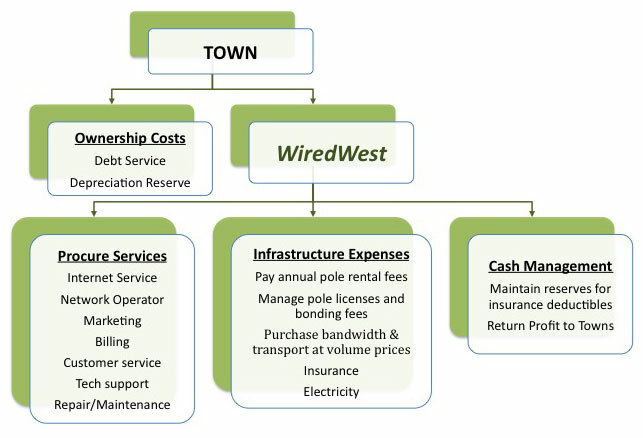 Once built, WiredWest will manage operation and expenses for member towns. Determine what services are needed. Seek and vet potential vendors, consolidating where possible. Use our large regional scale and competition to negotiate best prices and terms. Negotiate a contract – consolidates legal expenses. Periodic renewal of limited term contracts insures competition going forward. As owners of our insfrastructure, towns have to cover insurance and other related costs. Consolidating these regionally helps more sparsely populated towns afford these costs without significantly impacting denser towns. Also, spreading risk over the region reduces the chance of a catastrophic event devastating a single town. Aggregating shared bandwidth reduces cost. WiredWest will maintain cash reserves and return profits to our towns. An annual review of finances will determine how much can be returned and as take rates grow, whether we can lower prices. This page is available as a one page printable download.